I just received two new V6 Transceivers that were loaded with V1.1008 firmware. In trying to set up TTL Pass Through for my Nikon SB800, I could not get variable power, an issue that has been discussed on another Discussion Thread. Apparently has problems that were fixed with more recent firmware. 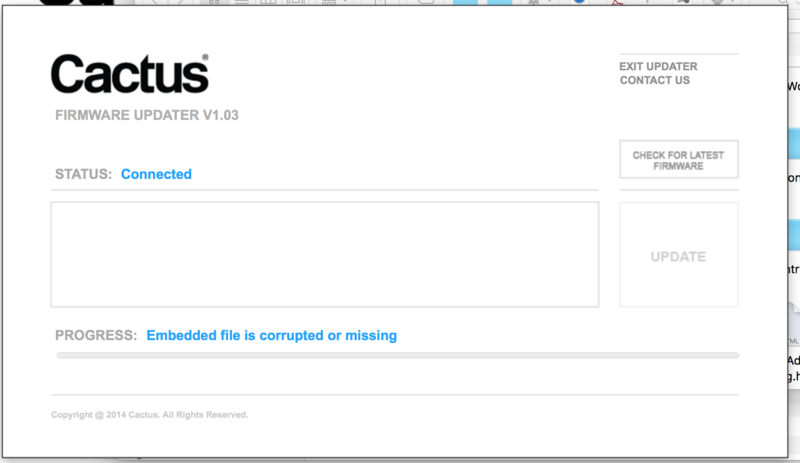 When I downloaded the Cactus Updater, and follow instructions, I receive a message that the status is "Connected", but the Progress bar reads "Embedded file is corrupted or missing". Please click “CHECK FOR LATEST FIRMWARE”, it will download the firmware file anyway as the panel shown “connected”. I hope that helps. Why can't I receive most recent firmware options for the Mac OS? Download site for Cactus for Mac OS shows Download version 1.08. In using that to try and update my RF 60 and V6, I do not get the most recent firmware. For the V6 I only receive the 1.1.0019; for the RF 60, I receive 202. Looks like RF 60 is now FW 204 and V6 is up to 2.1.001. Could it be you did not press this button before pressing the UPDATE button? Thank you, Antonio, that was it!